What is this site's purpose? This website was created to teach High School students the principles and ideas of the constitution, the process of passing an amendment, and the terms involved. The United States Constitution is the highest law of the United States of America. It was written on September 17, 1787 by the Constitutional Convention and later put into effect, or ratified, by representatives of the people of the first 13 states. 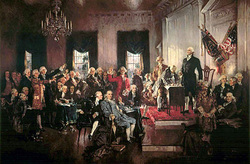 When nine of the states ratified the document, they created a union of states, and a federal government for that union. That government started on March 4, 1789. The Constitution of the United States is the oldest federal constitution now in use. Since 1787, changes have been made to the United States Constitution 27 times by amendments (changes). The first ten of these amendments are called the Bill of Rights.